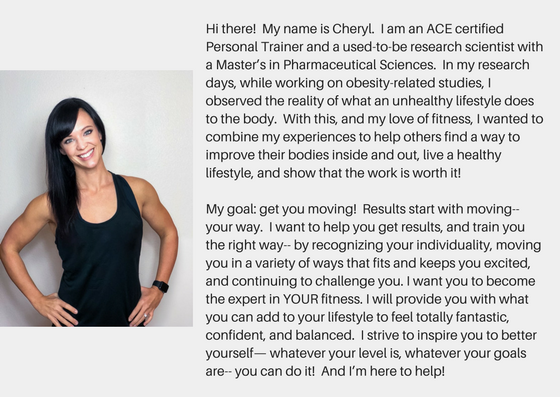 I serve people who are looking to improve their fitness and health through full customization, variety, and progressive challenges. 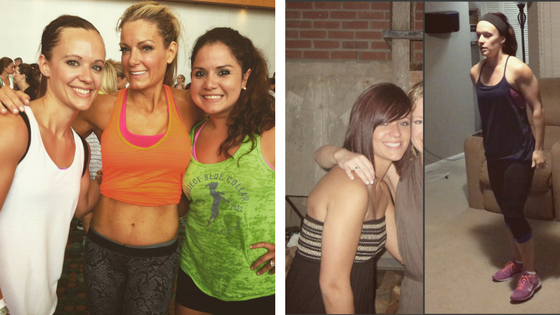 I give them the tools to look and feel totally fantastic and keep the momentum going. I’m here to inspire you to MOVE and better yourself, YOUR way! My passion is providing people the appropriate tools they need to look and feel totally fantastic, be confident, and live a life of balance. When it comes to weight loss, strength, reshaping our bodies, and staying motivated to keep moving, we all have obstacles to overcome. But you don't have to do it alone. Together, we can make it happen! My goal is to get people moving and keep them going! Moving them the right way-- by recognizing their individuality, training for functional fitness, challenging and adding variety, and providing them with what they can add to their lifestyle rather than struggling to remove. I strive to inspire you to better yourself-- while making it all feel deliciously pleasurable rather than a sacrifice. I am a mid-western girl from Ohio, but have started a new adventure in Seattle, Washington and lovin' it. Although I love living in the city, I grew up on a farm with lots of love, not just from family but from several pets. One day I wish to have a country home with room for as many dogs, horses, and other animals I can love! I am a dog lover! I grew up in a family that loved dogs more than most people. My husband and I are proud parents to two fur babies-- an English Bulldog and Basset Hound. I used to be the pickiest eater but now I LOVE trying new foods. I love exploring new restaurants and enjoying all that comes with the dining experience. 3 of my favorite splurges-- wine, pizza, and tacos. Flying is not my favorite but one day I hope to travel more. Goals = Spain, Italy, Argentina. A girl can dream! Favorite Workout = BodyCombat. Least Favorite = I hate running. It hurts! I am an online shopper. I love to try and be fashionable for less. If I could get paid to shop I would love my job! I am a wanna-be makeup artist (for myself). I like to attempt to beautify myself and have fun doing it! I grew up a small town girl with a loving family, wonderful friends, and lucky enough to never want for anything. But I was living with a label. I was the “shy” girl, with little confidence, always making others happy at my own expense, and essentially feeling like a door mat. I transitioned from small town shy girl, to city-living girl. I was meeting new people and getting a new sense of independence and confidence. I was having fun, but over-indulging in eating and drinking. but My social life wasn't doing my body any favors and my body confidence went down hill. I had been active most of my life. Growing up, I spent a lot of time on my Grandparents' farm running around, riding horses, playing outside. I loved doing step aerobics with my mom when I was just a little thing. I was involved in dancing for some time, and then dedicated the rest of my time playing competitive soccer. But that kind of went to the wayside when it was time for college and my priorities changed. When pursuing my graduate degree, I started frequenting the University Rec Center with a friend, and I fell in love with group fitness classes. I went to as many classes as I could and loved it! I got back in touch with my inner athlete, started getting back into shape, and focused on myself. Once I graduated and had to give up the Rec Center, I transitioned to at-home fitness programs, trying lots of different formats. I loved learning about programming and seeing how I could change my body. I felt great in my body, more focused, better balanced. I was experiencing a New confidence Mentally and physically by getting stronger and creating a healthy lifestyle that worked for me. After earning my Master’s of Science degree in Pharmaceutical Sciences and working as a full-time science researcher for 6 years, I felt something was lacking. My job had me working on several obesity studies-- very important research, but I felt very distant from the impact it could have. Although I had spent so much time in the world of science and research, I wasn't loving it anymore. why am I studying this in the lab, when I could directly help people with creating a fit, healthy lifestyle? I had done it for myself, I could help others do the same by applying my knowledge and skills. Isn’t that the better way to help the fight against obesity? It was time to start exploring other options, but I was scared. Change is scary! While change and the unknown is scary, it has been exciting and liberating to start something new! 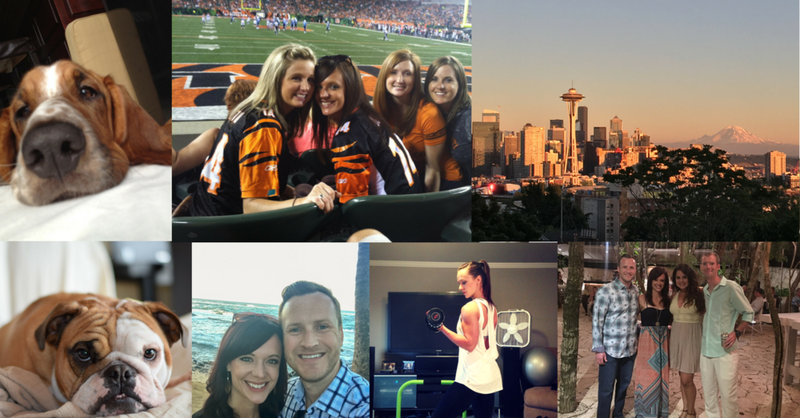 My husband and I left our life in Cincinnati, OH and moved across the country to Seattle to start a new chapter in our lives. I was able to make a break from the research career that was unfulfilling and explore something different-- a professional career in fitness. I am happy to say I am now a certified Personal Trainer! What does this mean? Although I have had experience in "training" almost my entire life, and I have an understanding of the human body with my years spent in science, I am now certified by an NCAA accredited agency (American Council on Exercise) to train others! Professionalism, knowledge, and safety of clients is important to me. It is extremely rewarding to meet and work with new people every day. I’ve been training in-home clients for 2 years now. If you think you'd like to train with me, feel free to send me a message! Check out my services here. You can also find me training clients and coaching CrossFit, Bootcamp, and Cycling classes at Riot Athletics in downtown Seattle. My experience up to this point in my life has taught me positive changes come from taking care of yourself-- your health, mind, and body. Change is possible for anyone-- and I hope I can help others discover what is possible for them.